We asked local landscapers to share their favorite mini-me versions of plants. Little Moses Dwarf Burning Bush. Morgan McAdams, Chesterfield Valley Nursery. Bushel & Berry fruiting shrubs Peach Sorbet Blueberry. Laura Caldie, Greenscape Gardens. Aster 'Snow Flurry.' Cathy Pauley, Papillon Perennials. Candy Apple Hydrangea. David Sherwood, Sherwood's Forest. If you find yourself tight on space in the garden or prefer container gardening, using compact and dwarf versions of plants can provide the same effect in a smaller package. We asked local landscapers to share their favorite mini-me versions of plants. “The Little Moses Dwarf Burning Bush is one of my favorite dwarf shrubs due to its compact size, upright form and color. Only reaching a height of around 3’, this tight shrub has great dense, summer foliage. 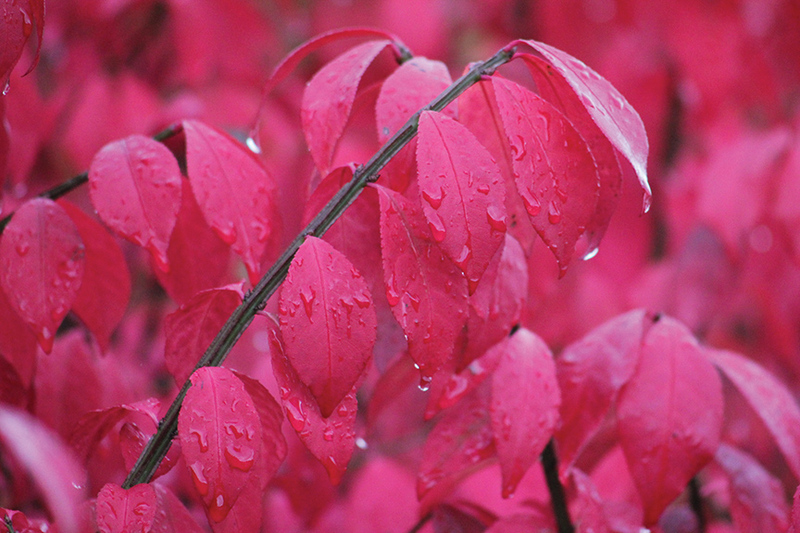 In the fall, this shrub puts on a showy display of fire-engine red foliage making it great for that pop of fall color within a landscape or quite the eye catcher as a low-lying hedge.” Morgan McAdams, Chesterfield Valley Nursery. 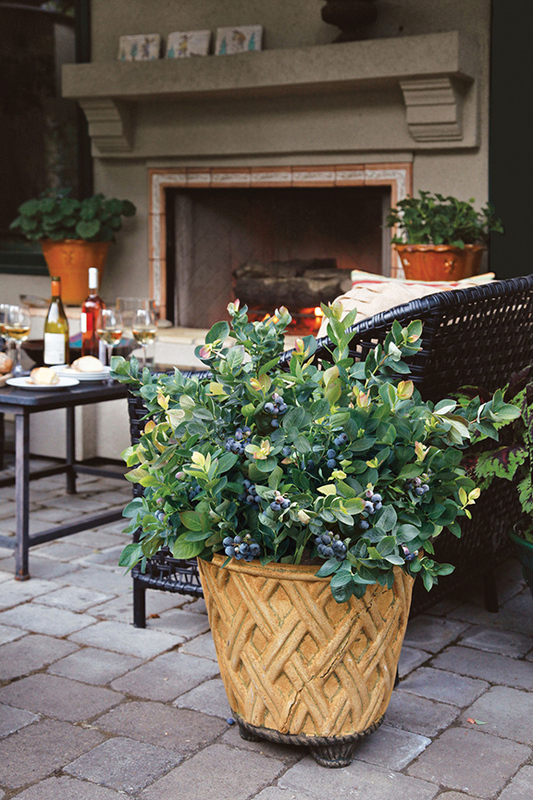 “The whole line of Bushel & Berry fruiting shrubs are a beautiful addition to any patio container or landscape, but our favorite is the Peach Sorbet Blueberry. Spring blooms are showy and a pollinator favorite. Summer yields tasty fruits. Fall brings an explosion of warm colors, and winter foliage holds strong in shades of purple, making it a four-season spectacle!” Laura Caldie, Greenscape Gardens. “Our favorite compact perennial is Aster `Snow Flurry'. This was a new one for us this year, and we have fallen in love with it. 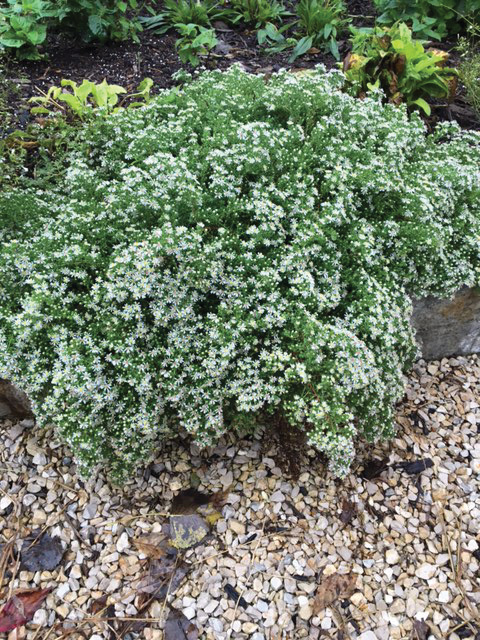 It makes a wonderful low groundcover so dense that weeds can't get through. It is a great substitute for spreading dwarf junipers and at first glance it almost looks like one when it isn't blooming. In the fall it is smothered with white flowers. It is only 4-6 inches high and 2 feet across, likes full sun and is very drought tolerant. It is a nativar developed from Aster ericoides and is a good late pollinator for bees and butterflies. As a bonus it is also very deer resistant and has stood up to the multitudes of deer in Wildwood! It can also be used in rock gardens.” Cathy Pauley, Papillon Perennials. 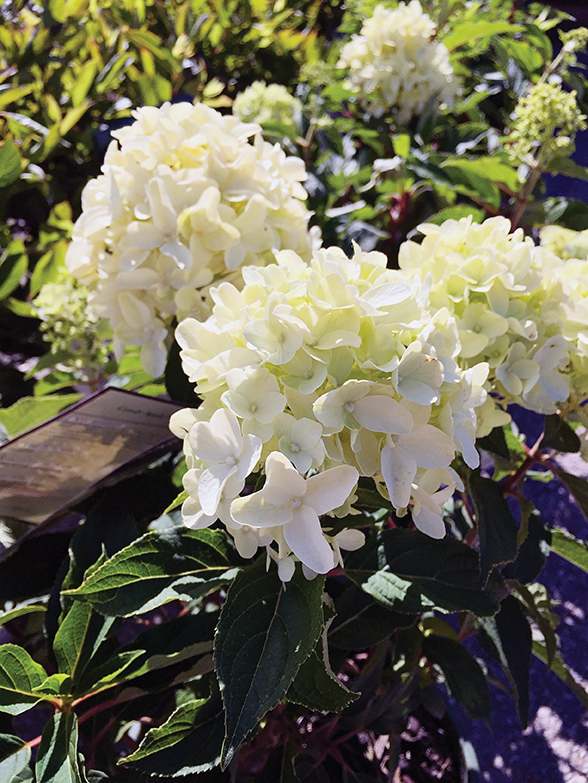 “The Candy Apple Hydrangea is the perfect summer-blooming, sun-loving Hydrangea. This new, improved paniculata has flowers that will last through fall and can be kept 3 feet or smaller.” David Sherwood, Sherwood’s Forest.